Hamister Group, LLC is proud to offer luxury lofts for rent in historic Lafayette Square in downtown Buffalo, NY. The lofts share the building with our brand-new Hilton Garden Inn. Residents get many of the comforts offered to our Hilton Garden Inn guests, including access to the pool and gym. Each unit has an in-unit laundry, hand-scraped hardwood floors, stainless steel appliances, and a walk-in shower. In addition, valet parking is included for all residents, and you’ll get either one or two parking spaces, depending on which unit you rent. The building has a 24-hour lobby attendant on the first floor (courtesy of the Hilton Garden Inn), and key fob building security access, so you can feel safe and secure. Our lofts feature a prime location in downtown Buffalo, with great views of the city and tons of Buffalo entertainment and attractions nearby. Our building is less than 10 miles from Niagara Buffalo International Airport. Enjoy fantastic connectivity via the Metro, just steps from our front door. We are within walking distance of the theatre and entertainment district, near shops, museums and numerous award-winning restaurants. Hamister Group, LLC purchased the historic Tishman Building in downtown Buffalo, NY in December 2012 and immediately began work on a total transformation. 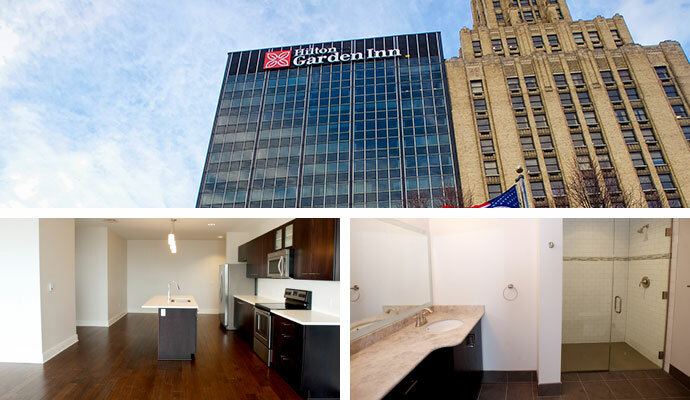 Now known as 10 Lafayette, the building transformation is complete, with the Hilton Garden Inn Buffalo Downtown opening for business in October 2014. The hotel occupies the first 14 floors of the building, followed by three floors (15-17) consisting of our eighteen luxury lofts, and concluded with Hamister Group, LLC's corporate headquarters on the top three floors (18-20). Go to our website today to contact us and find out pricing, and any other details you need!